“How did it look?” I asked. Like most pitchers these days, the young man was conditioned to ask for the coaches opinion. You gotta realize that today’s pitching generation has grown up in a facility where pitching lessons are the norm. And in my experience, the more time a pitcher spends in lessons, the more addicted he becomes. As I’ve written about many times, the majority of young pitchers are addicted to pitching mechanics. I call them Pitching Mech-Addicts. These guys blame any and everything on pitching mechanics. They don’t trust their instincts. And because of this lack of trust, they struggle to FEEL anything. Because they’re constantly at the mercy of another man’s opinion. Much like a Victoria’s secret model walking the runway. After each and every throw, waiting for a cat-call or seductive whistle being vocalized by their instructor. They chuckled. Then realized I was serious. Until you can FEEL your pitching mechanics, they’re not really your pitching mechanics. Because as long as the efficiency of your pitching mechanics are at the discretion of another man’s opinion, they’re going to constantly be in a state of flux. Changing with the winds. And whenever you’re constantly changing, without any notion of why they should be changed… Except the coach “said so”. You’ll never reach your potential. 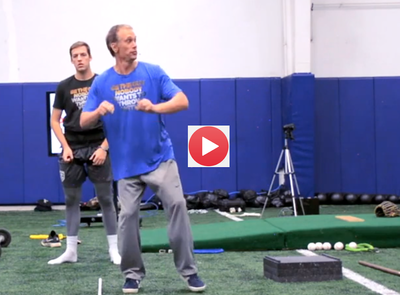 The top pitching coaches in the country, the ones I’m fortunate enough to call my close friends… Don’t care how your pitching mechanics look, only how they FEEL. Can you FEEL what the Feedback is telling you? Because until you know what’s causing the data to be the data, the data is useless. And that’s the top priority in each of my 3-Day Core Velocity Pitching Programs. I teach you how to self-coach so you’ll never, ever have to rely on another man picking your wife, or your pitching mechanics. You’ll leave with a 4-step simple process which will allows you to create a FEEL for the data. You’ll have the self-coaching system you need to create a learned association (FEEL) for the data and really, that’s what development is all about. If you’re ready to become your own best pitching coach, click the link below and reserve your spot today before someone else takes your spot. P.S: The top pitching coaches in America are the top pitching coaches in America for a reason. Crazy to think they share the same idea and fundamental concepts we discussed in today’s post. The message in this video is one every single pitcher needs to hear, immediately! (Click the GIF below to hear the message loud and clear.) . Do me a favor and leave a comment after watching. Thanks! Great Stuff Lantz!!! I’m a believer brother!! « How Did Lucas Giolito Revamp His Arm Action?